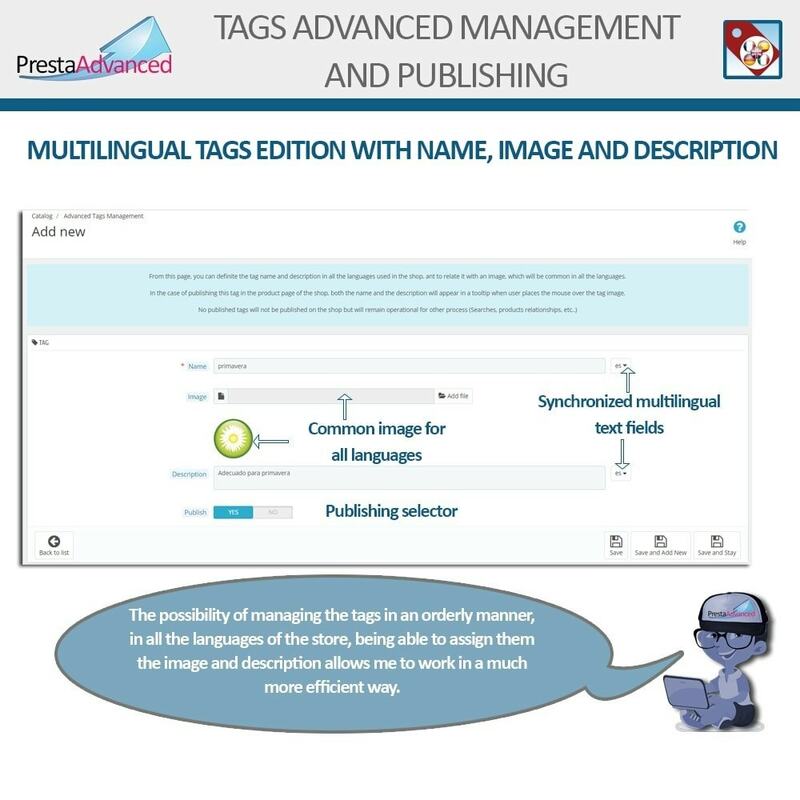 Advanced multilingual tags management with image and description. 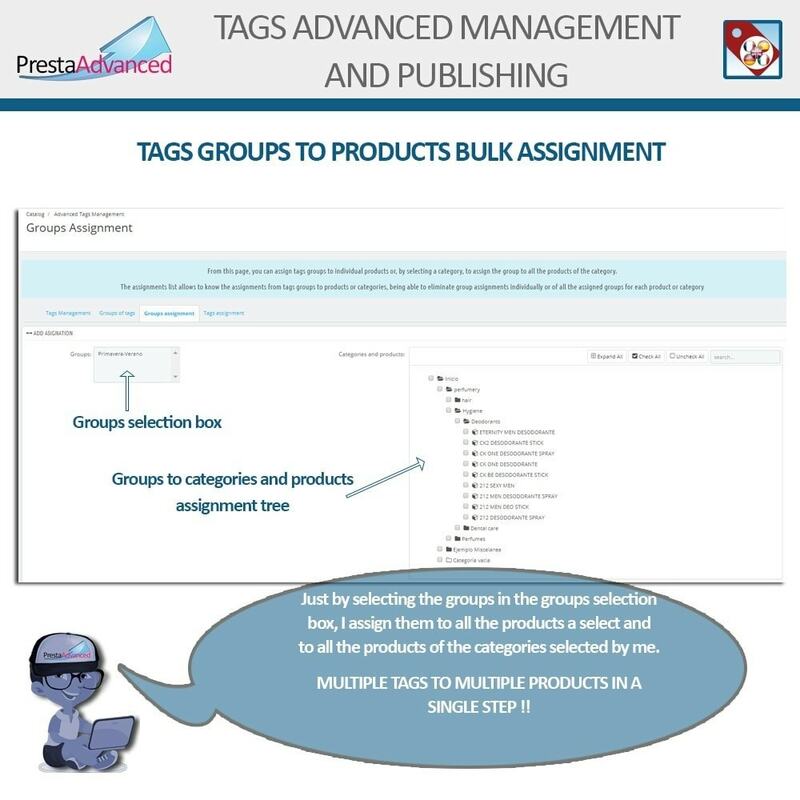 Tags grouping, in order to an easy assignment to products, allows the tag images publishing with informative tooltip in the product page. 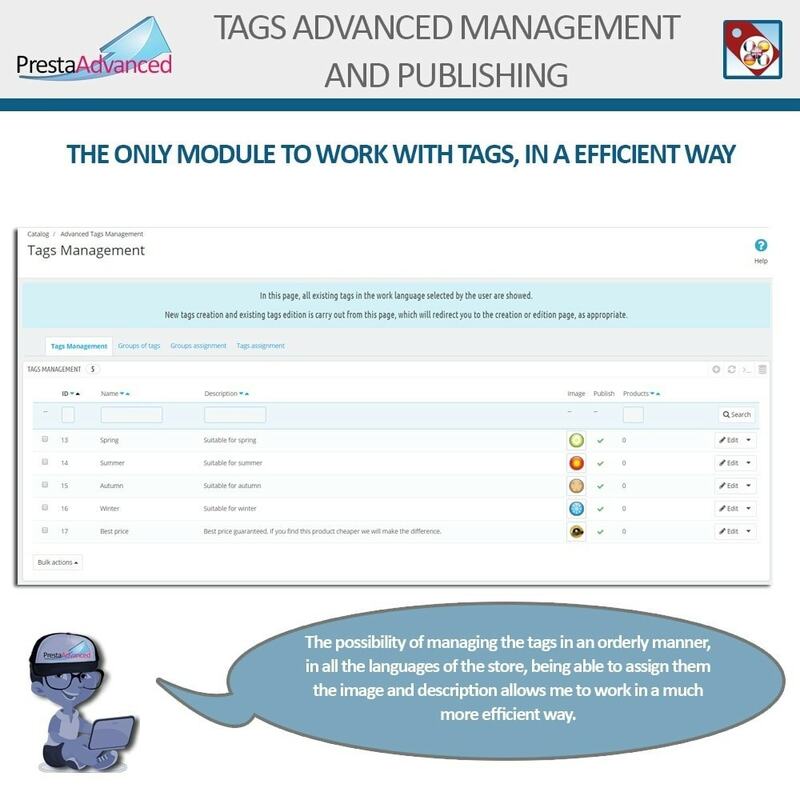 The module adds its own tags management system that, in all moment, maintains synchronization with PrestaShop's native tags management method. 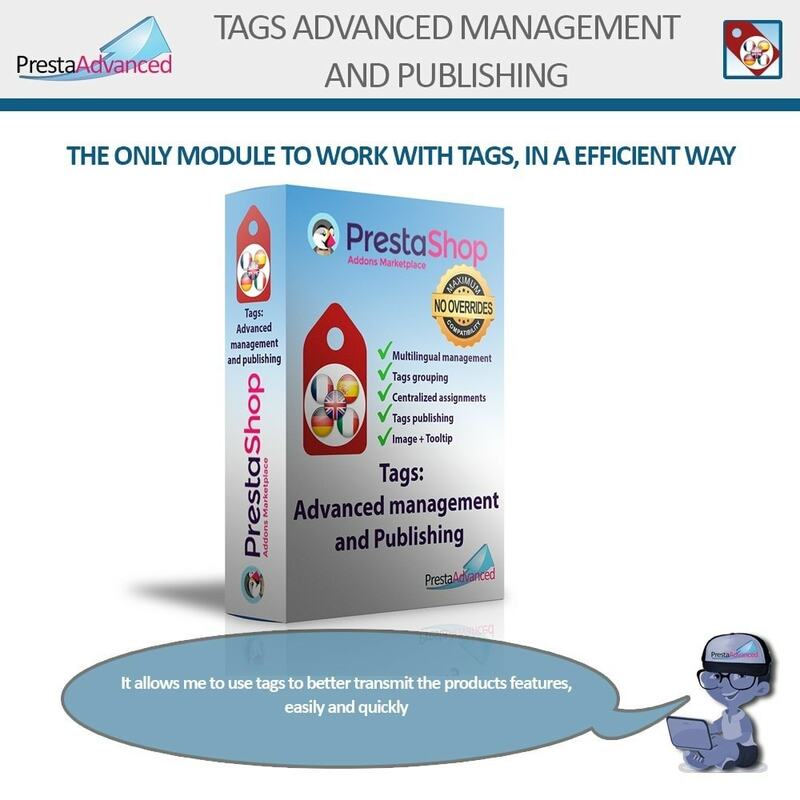 The module allows to work with the tags in PrestaShop, in a similar way to the one that is used in many other sections, automatically realizing the work of synchronization between the different languages ​​of the store saving a lot of time and avoiding errors. 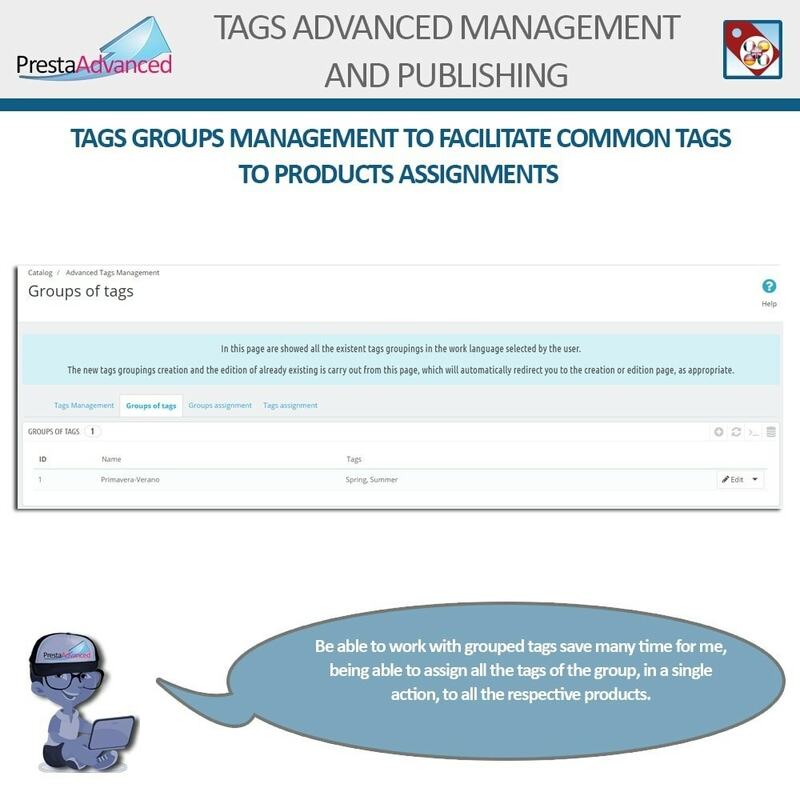 With the tag assignment to a product, the tag is assigned in all the languages. 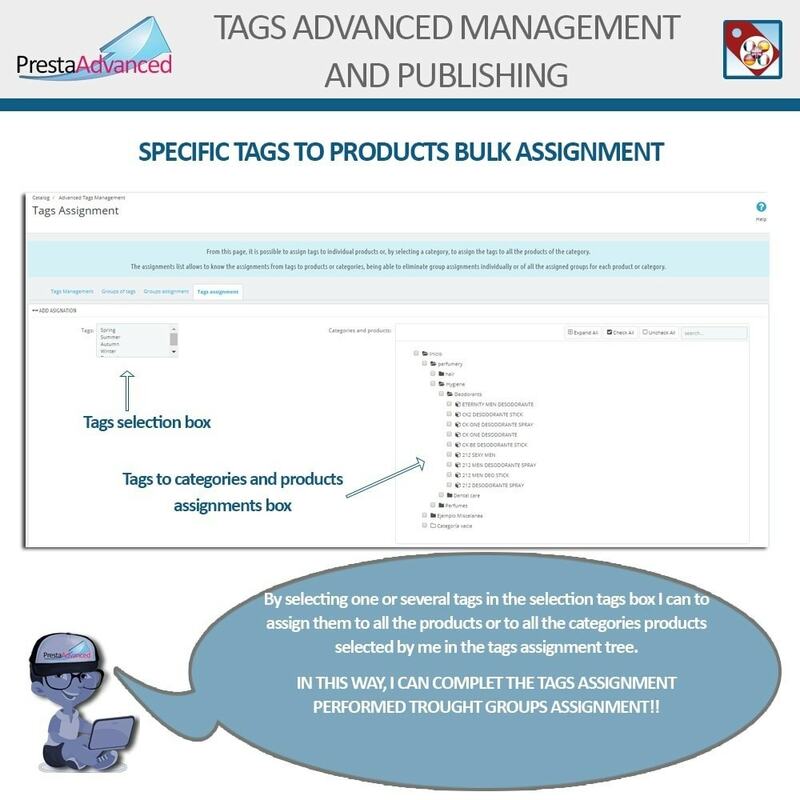 The system allows performing groups of tags that make possible the assignment of the set of assigned tags to a product, many selected products or all the products of a category in a single click. 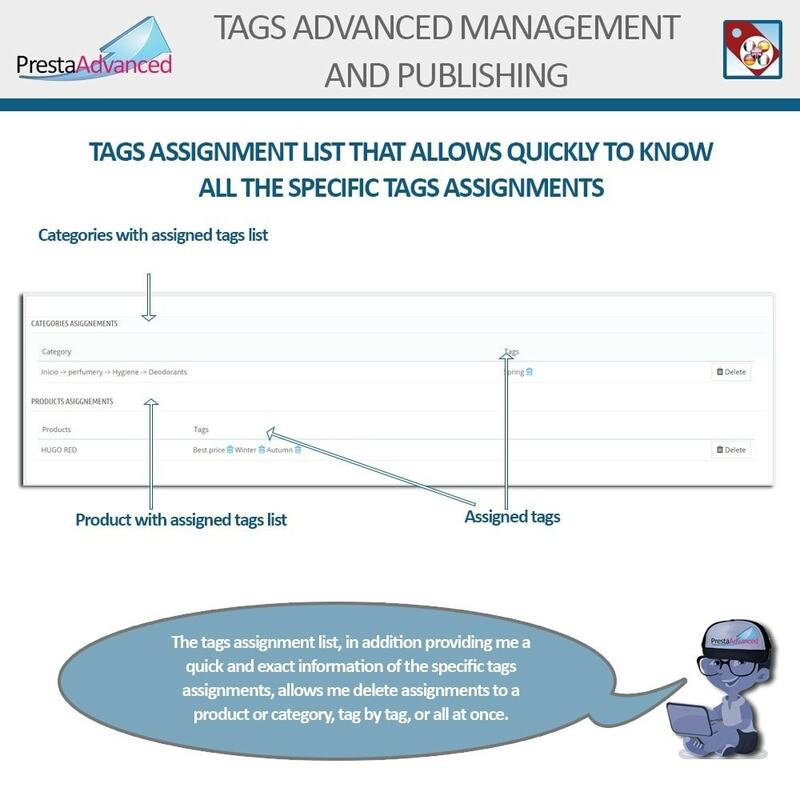 The lists of the management system allow to easily control the tags added to each product as well as performing the necessary modifications. 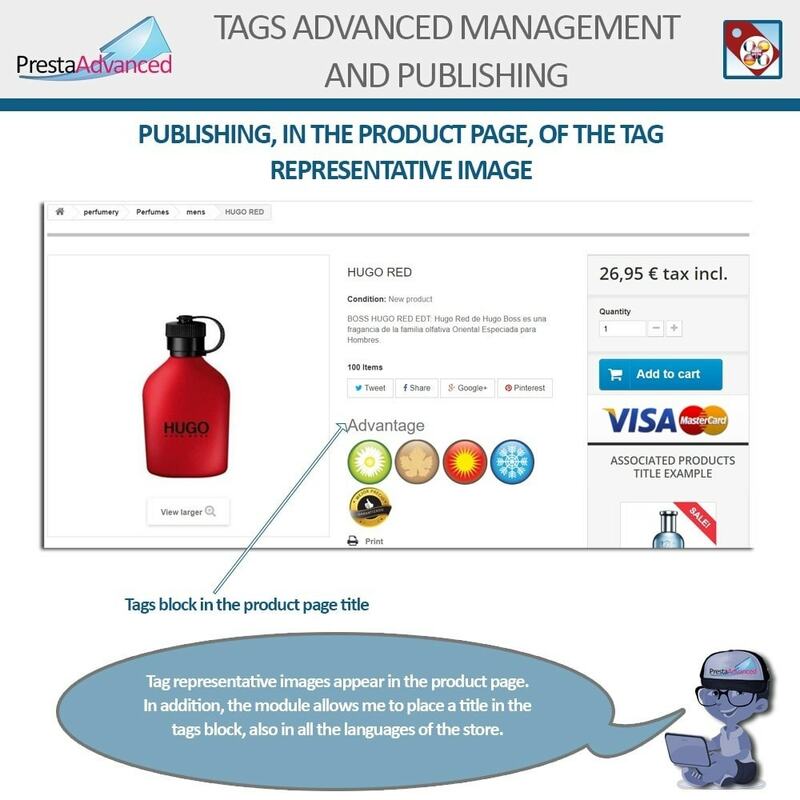 It allows to display in a graphic and prominent way all the advantages, situations of the product, offers, and any quality of the product or associated with it that you want to show on the product page. 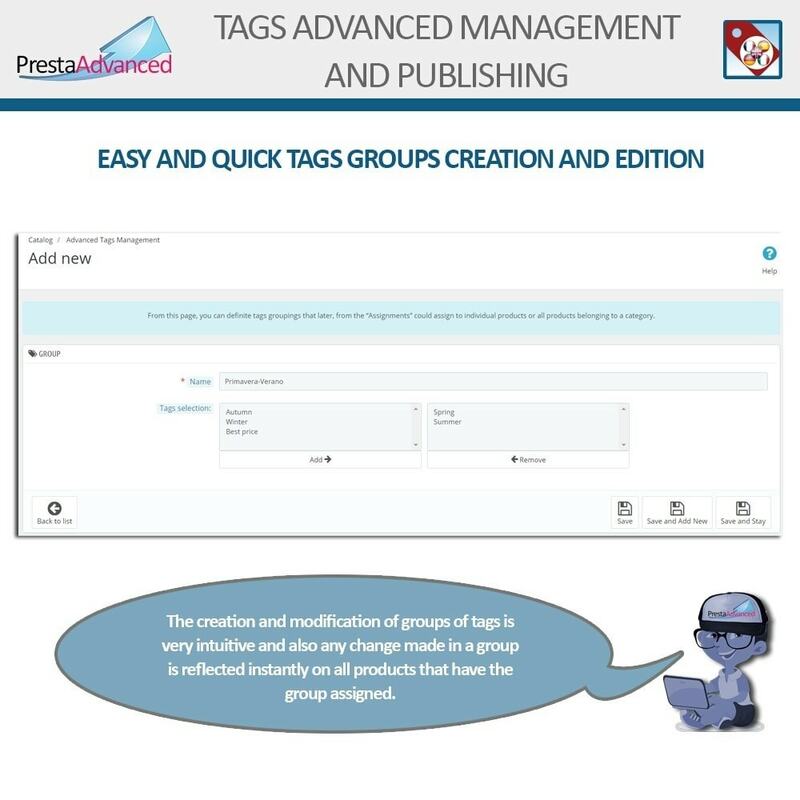 Tags management and publishing module allows the seller to make efficient use of the tags in PrestaShop. 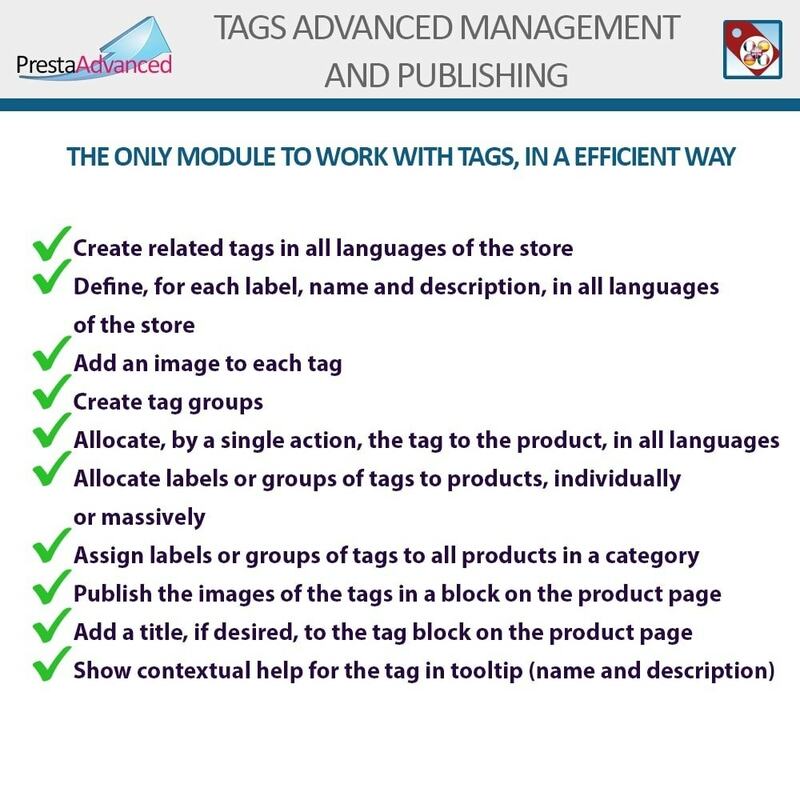 The module adds its own tags management system that always maintains synchronization with PrestaShop's native tags management method. 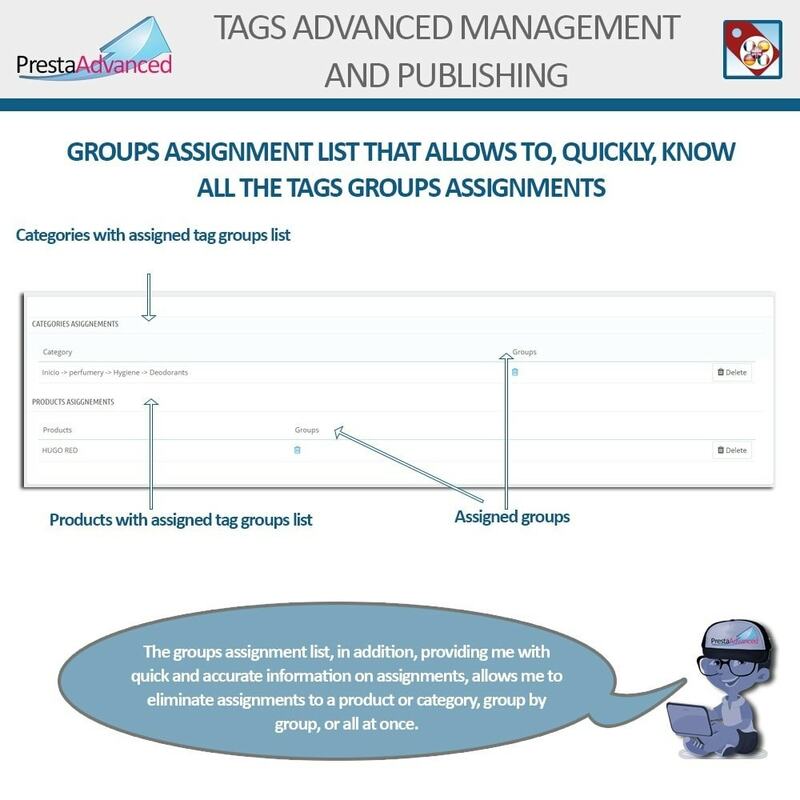 Advanced Presta Search Pro - adds a dynamic product search bar with an option to filter by category and manufacturer and much more options and customizations. All this, always in the language in which the store is being displayed. The ultimate module to get the most out of cross-selling in your PrestaShop store. Set up and control 7 types of cross sales in 5 publication positions. 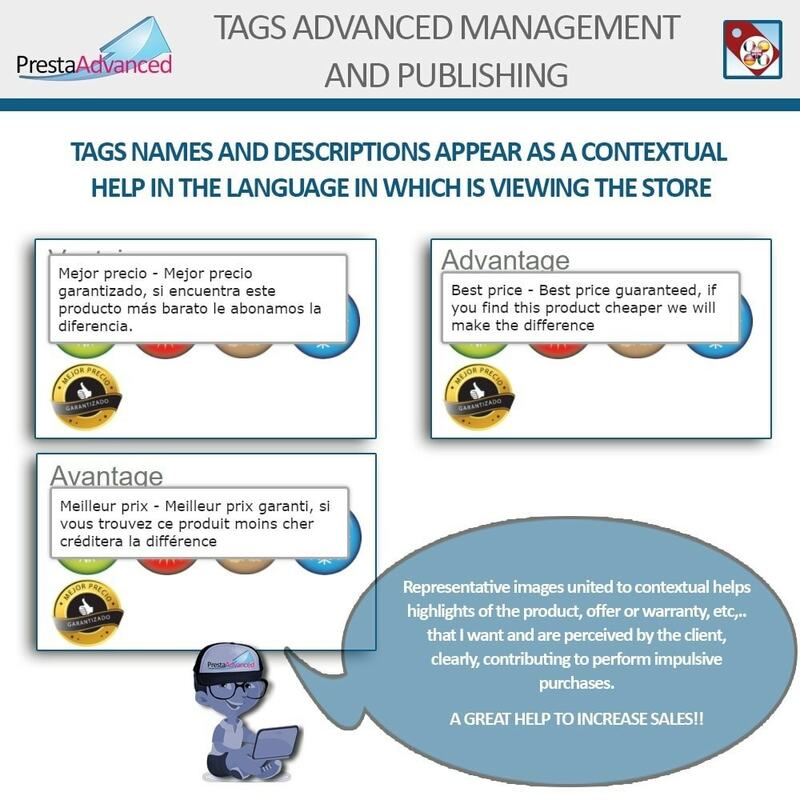 It relates the products to each other at the product and category level. Advanced, centralized feature management. It allows assigning multiple values to a characteristic, creating groups of (characteristic - value) and assigning them easily and quickly to multiple products.